Beautiful, brilliant colors, fast to sun and rain, are dyed into 100% nylon, with its soft supple hand. Our superb construction, complete with heavy canvas heading and brass grommets lasts and lasts. The Arizona state flag is a thing of beauty and color that represents the magnificence of the state. 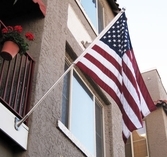 As stated on the state's official website, the flag originated when "Charles Wilfred Harris, Colonel in the Arizona National Guard, served as the captain of the unit’s rifle team in 1910. During the rifle competition at Camp Perry, Ohio, the Arizona team was the only team without an emblem of any kind. Colonel Harris was chiefly responsible for the creation of the rifle team flag that in 1917 became the Arizona State Flag." When one looks at the flag of Arizona, they will notice 13 rays of red and yellow on the top half. These are the same as the colors of the flag of Spain and represent the original thirteen states. The red and yellow colors also appear similar to the Arizona sunsets. Arizona is the largest producer of copper in the United States, and the copper star in the middle of the flag represents the copper industry. The flag of Arizona is also colored in blue, something that matched the blue in the flag of the United States. This color represents liberty, a freedom that is deeply valued in the state. The Arizona flag is simple, yet regal. It embodies the color of the state and truly is a beautiful emblem of the western state. The red, yellow, copper and blue colors of the Arizona flag are timeless and legendary.